Empty cans, sunscreen bottles, throwbags and Barbie dolls. Cam straps, water bottles, Pelican Boxes and biners. With the Clavey Mini-Skirt hanging off the front of your (or any other cross bar of your frame), now you've got a place for all those little things that didn't already have a place. 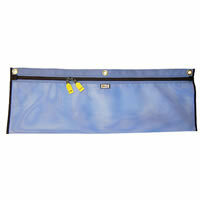 The dual heavy-duty YKK zippers make access, both easy and secure while the plastic polyester mesh will stand up to years of abuse. Colors vary. From Anonymous of Pocatello, Idaho on 2/6/2015 . From Harry Dundore of Chico, California on 3/29/2013 .